I love Christmas! As a Christian, I believe in the true reason for celebrating the season but I also love the trimmings that go with it in this modern world. My nativity always sits beside the tree and above the presents and the children are taught the true reason for the celebration. I love the idea of the perfect tree, the perfect table, the perfect presents for each member of our ever growing family under the tree. Unfortunately I set the bar too high for myself and am disappointed when I fall short which I invariably do! That is on me; part of my OCD and something I am learning to deal with; the perfect doesn't or shouldn't matter. I should have cherished the decorations the children made in school and hung them on the tree for all to admire, I now wish I had. As you can see from my photo, my favourite colour is blue and everything has to match; I love that my daughter-in-laws deliberately wrap their gifts in rainbow colours to help me realise that little things like that aren't important, it is more important for us to be together, to share that special time with each other and, as those occasions are rare, they are all the more precious. Thank you for looking and for any comments you may leave, best wishes. Oh your tree looks lovely, and while color coordination does look really beautiful all the presents under the tree are a reminder of all the blessings we receive from each other.. love your blue color combo.. blue is also one of my fav colors too.. This is very beautiful- I also love Christmas- and like you, I love things to be perfect and match as well!! I think you've achieved that with this layout :)- all the blues look just beautiful and your clustering and flourishes are divine!! Thanks so much for joining us @ OUAS!! Beautiful Christmas layout! Love your color choice! the end result of this page turned out perfectly!!! as i knew that you would make it. and bordering all your work in the dark blue make it all stand out. Oh, this turned out so beautiful! I love that you used non-traditional colours on this Christmas layouts. It looks so neat. Thank you so much for playing along at OUAS! such an elegant and pretty LO! the color combo here simply stunning! SO gorgeous!!! I love blue on a Christmas page, always so elegant!! Thanks so much for joining us at OUAS!! 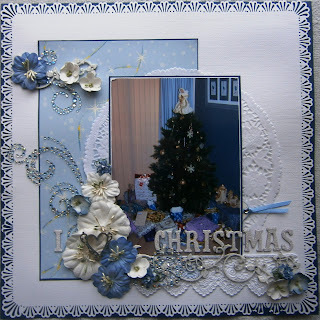 I love your blue Christmas page.Soo pretty. And I enjoyed reading your frank journalling about perfection etc. I used to want to be perfect but with all the demands being made on me from all over the place I have come to realize a long time ago that I will not be near perfect. Actually I don't think it's in my nature :-) But that's fine. At least I think this page is absolutely perfect!! TFS!